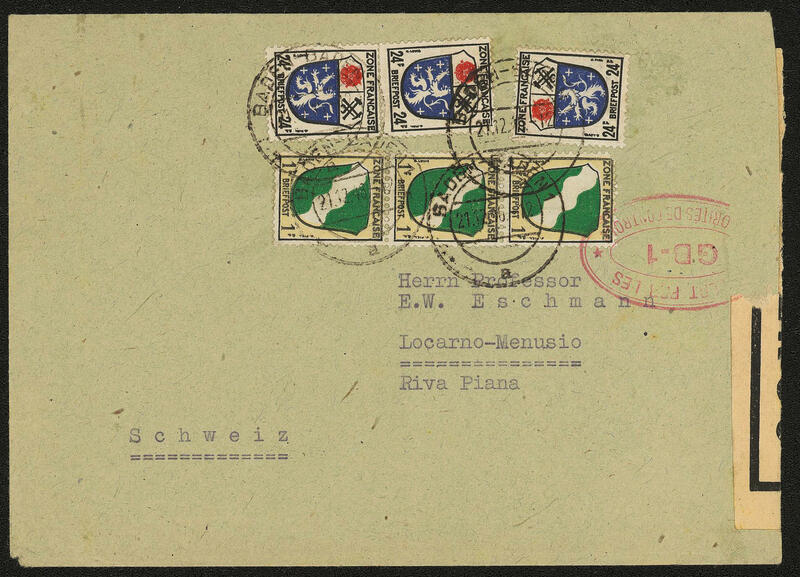 6610 Bl.2FII Red cross souvenir sheet 1949, with spectacular variety \"30 penny missing\", fresh colors and in full original size, in perfect condition mint never hinged this souvenir sheet belongs to the large rarities of the French zone, there are only few examples from this known. Photo expertize Schlegel BPP. 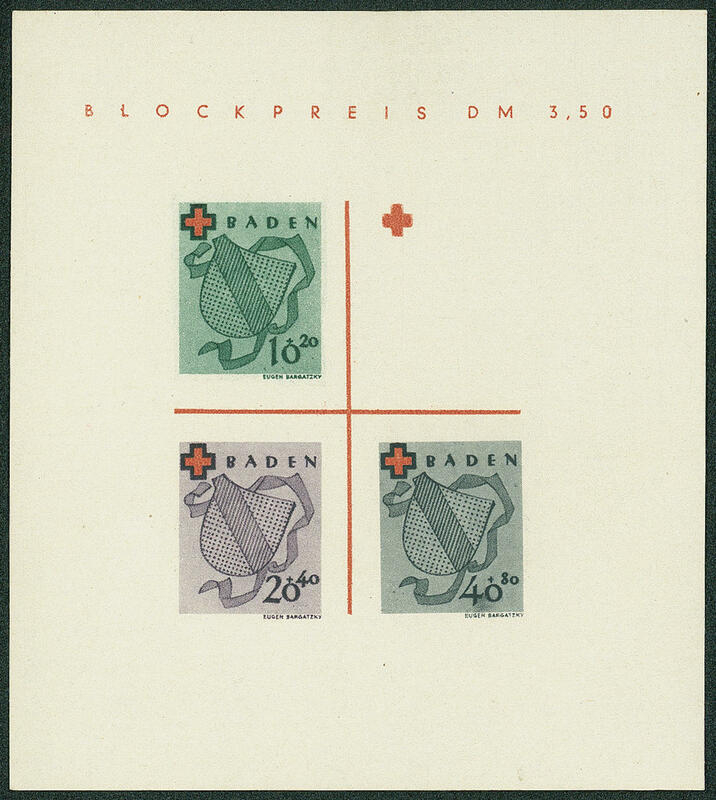 6612 ⊙ Bl.2I Red cross souvenir sheet 1949, type I, fresh colors and in full original size, with especially beautiful centric red special cancel \"FREIBURG HENRI DUNANT founder of the Red Cross 19.5.49. \". 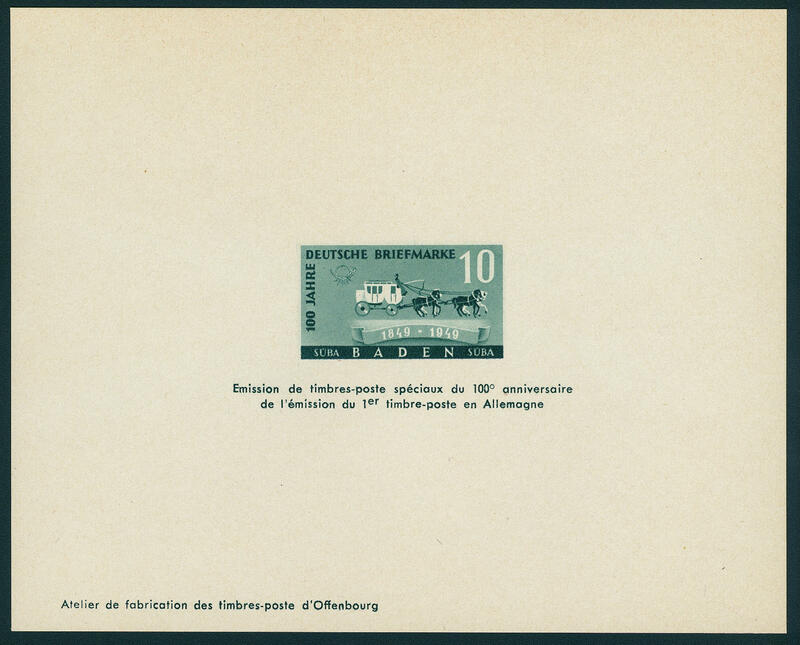 An outstanding quality souvenir sheet for the highest standards! Photo expertize \"the quality is perfect\" Hans-Dieter Schlegel BPP. Michel 2000,- €. 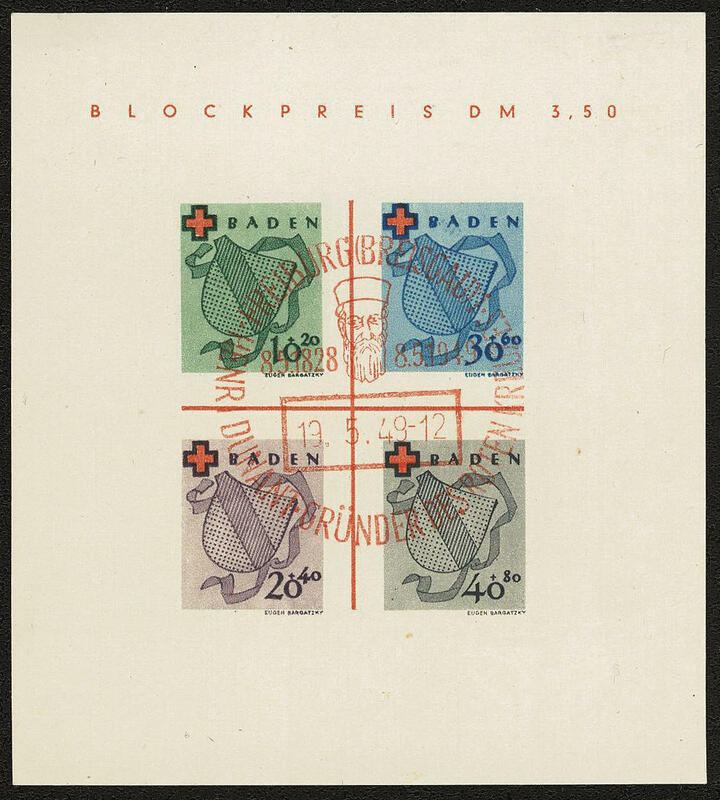 6613 ⊙ Bl.2I Red cross souvenir sheet 1949, fresh colors and in full original size, especially nice centric cancellation \"FREIBURG 28.4.49\" in utterly perfect condition. Photo expertize \"the quality is perfect\" Hans-Dieter Schlegel BPP. 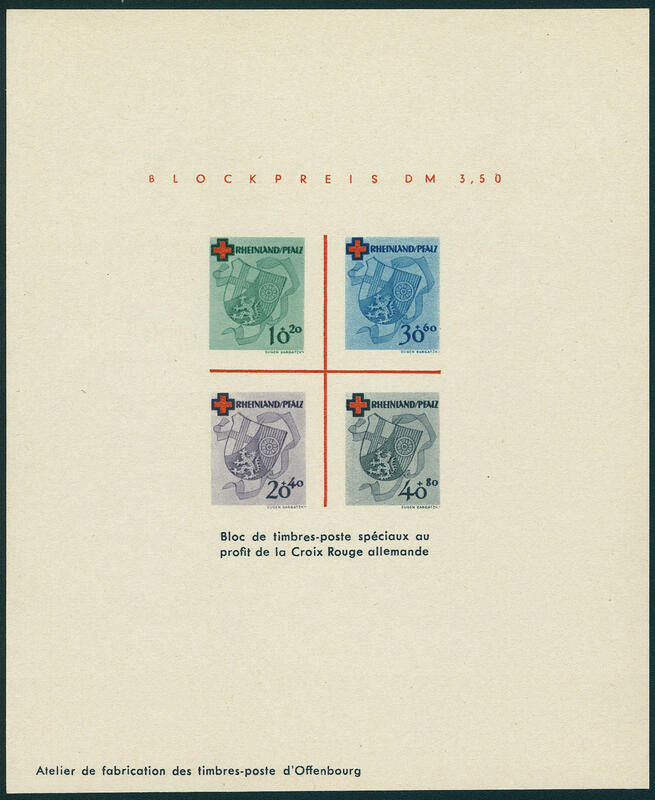 6614 Bl.2M Red cross souvenir sheet 1949, the scarce Secretary of State souvenir sheet fresh colors and in full original size in perfect condition. 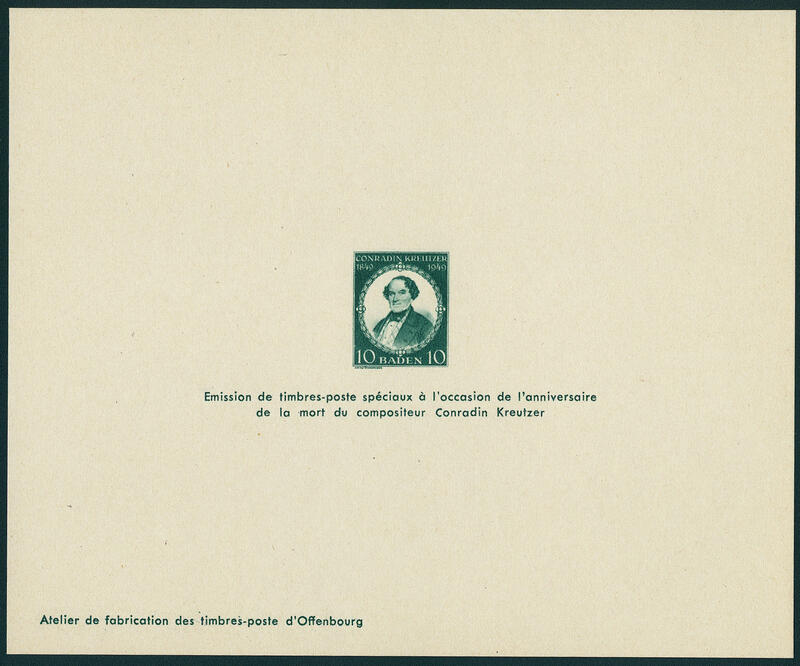 Very small edition and by Michel undervalued! 6615 ⊙ 46I 30 Pfg. 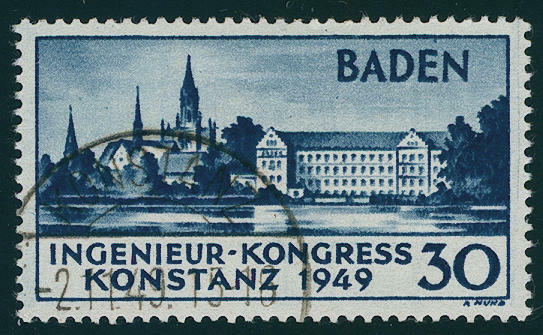 Constance I, faultless block of four from left margin of sheet, with centered appropriate special cancel \"Constance 25.6.49. \", expertized Schlegel BPP. 6616 ⊙ 46I,47/49 30 Pfg. 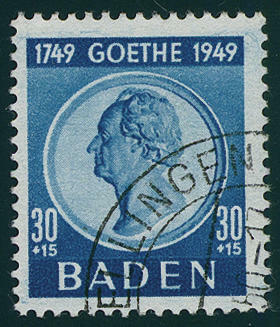 Constance I and Goethe set, neat cancelled, expertized Schlegel BPP. Michel 195,- €. 6617 ∆ 46II 30 Pfg., the scarce 2nd edition, fresh colors and in perfect condition on magnificent letter piece, neat cancelled \"FREIBURG-HASLACH 3.11.49. \", twice signed Schlegel BPP. Michel 1900,- €. 6618 ✉ 46II 30 Pfg. 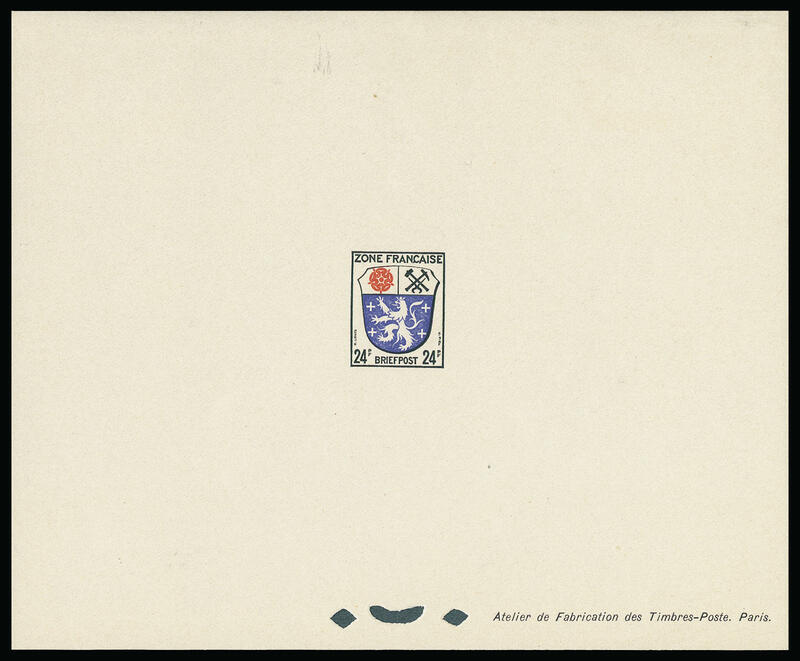 Constance II with additional franking 10 Pfg. 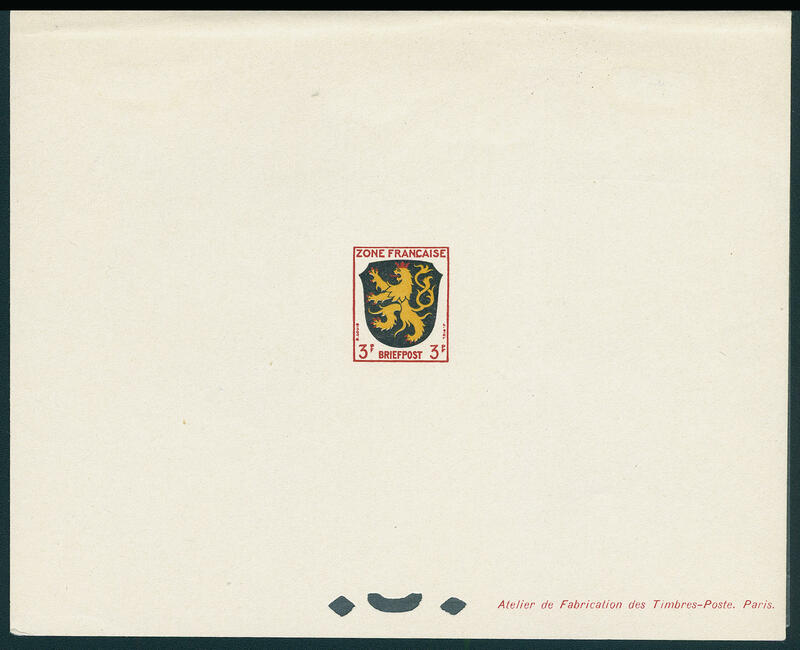 Kreuzer (2) on very nice small-format postage exceeding tariff rate cover from \"RASTATT 25.10.49\" to Kassel-Harleshausen. 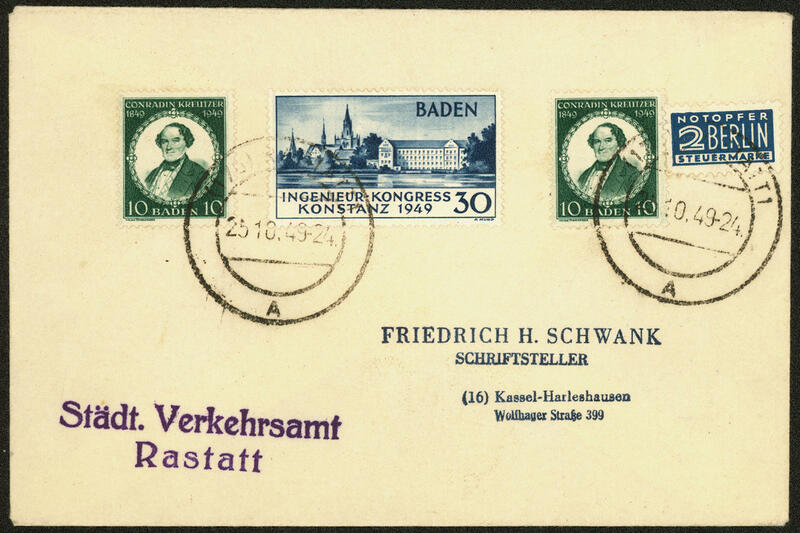 An especially fine example this sought-after and rarely stamp in perfect condition, twice signed Schlegel BPP. 6619 46M 30 Pfg. 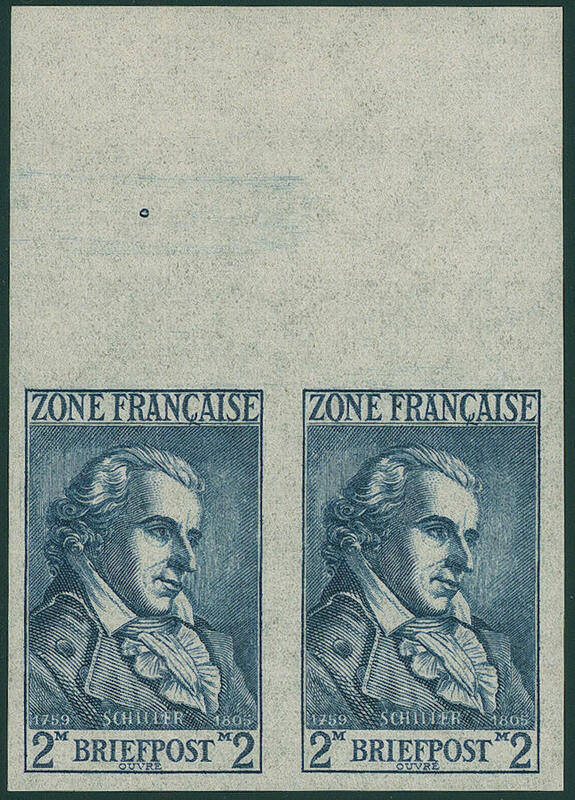 Constance 1949, the scarce Secretary of State souvenir sheet, fresh colors and in original size in perfect condition. By Michel undervalued! 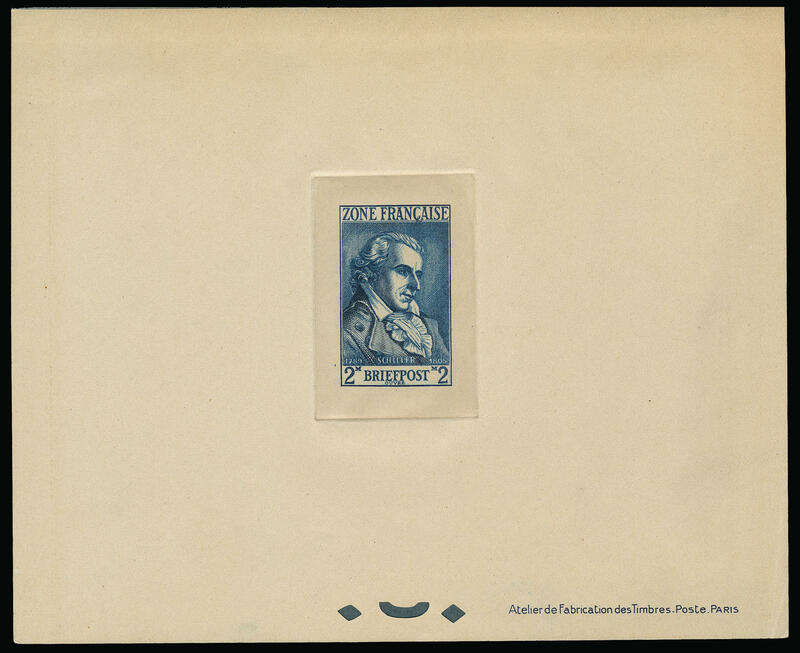 6620 50/52M Schurz 1949, all three Secretary of State souvenir sheets, fresh colors and in original size in perfect condition. By Michel undervalued! 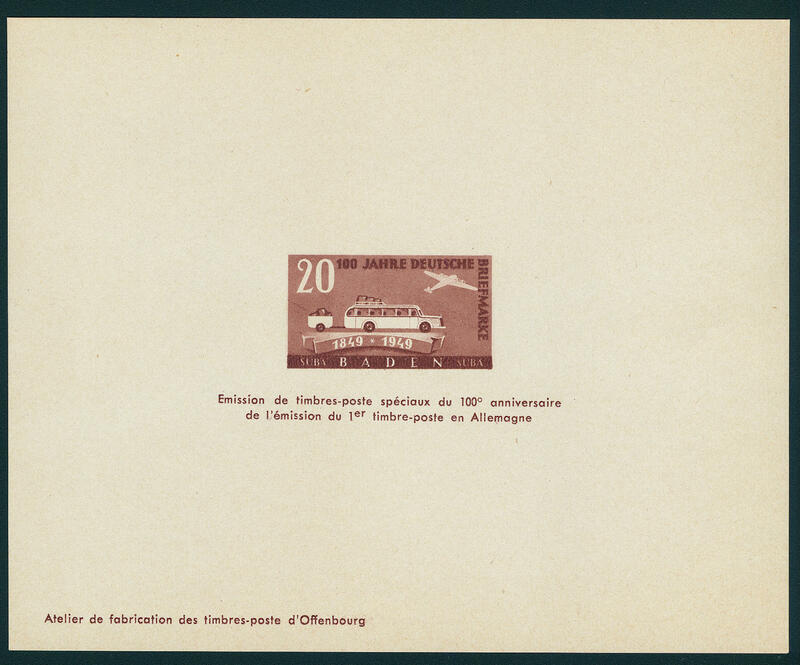 6621 53M Kreutzer 1949, having bright colors Secretary of State souvenir sheet in original size, faultless. 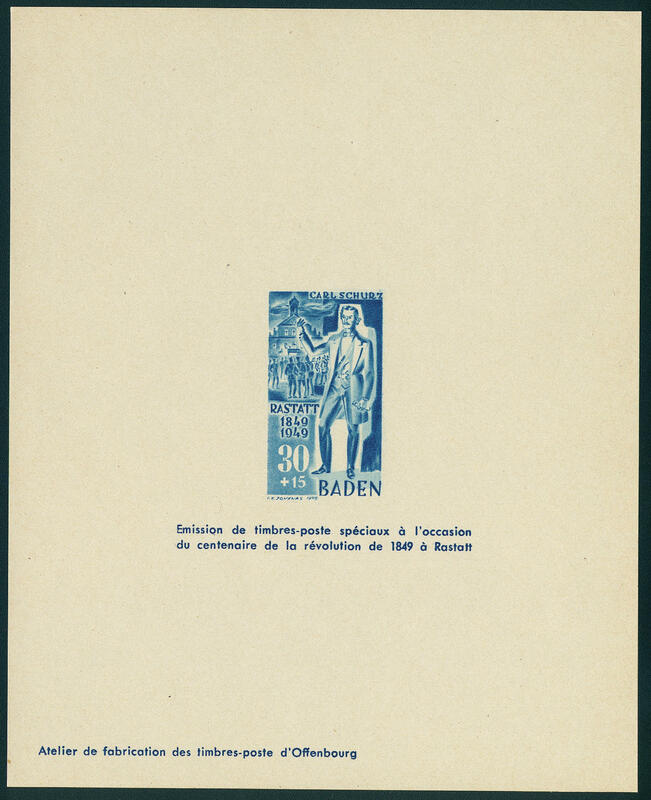 Small edition and by Michel undervalued! 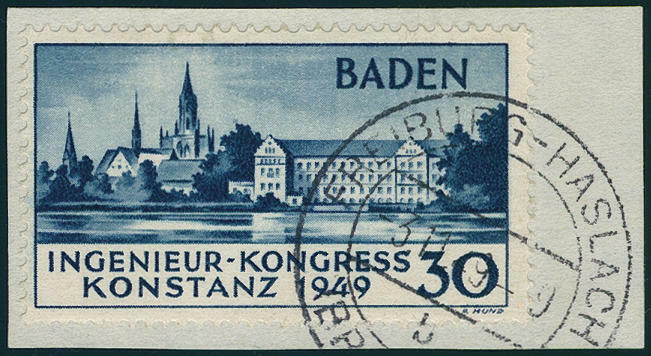 6622 54/55M A hundred years German stamps 1949, both Secretary of State souvenir sheets, fresh colors and in original size in perfect condition. 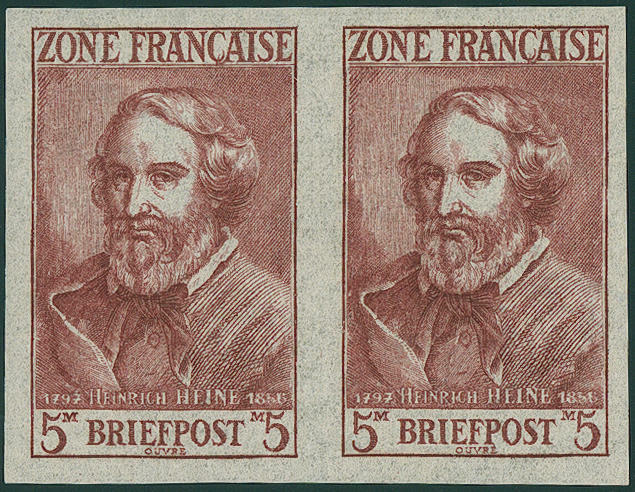 Issued only 75 sets and by Michel undervalued! Photo expertize \"perfectly quality\" Straub BPP. 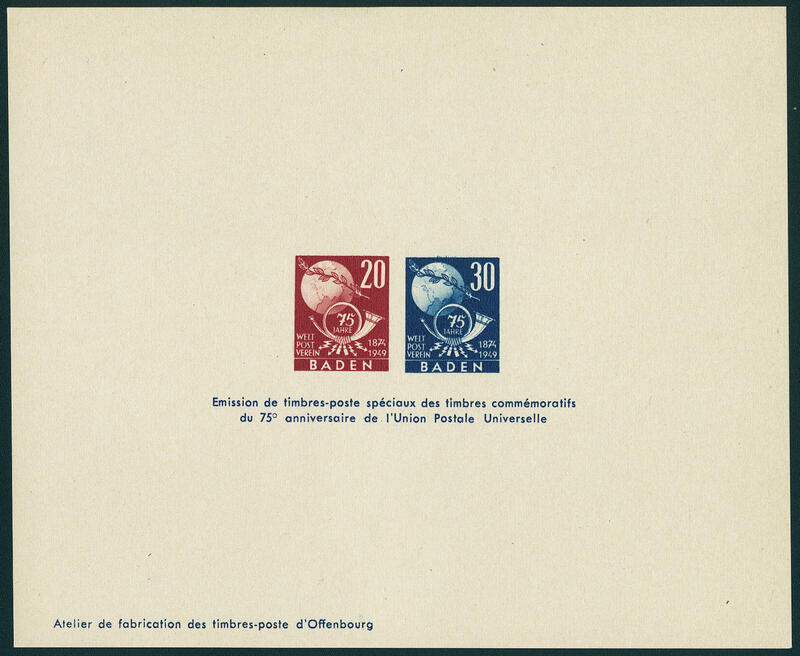 6623 56/57M Universal Postal Union 1949, having bright colors Secretary of State souvenir sheet in original size and perfect condition. 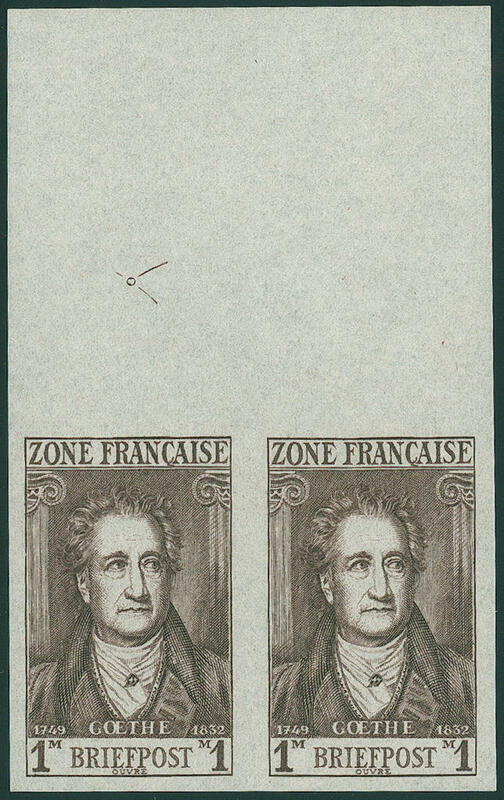 Very small edition and by Michel undervalued! 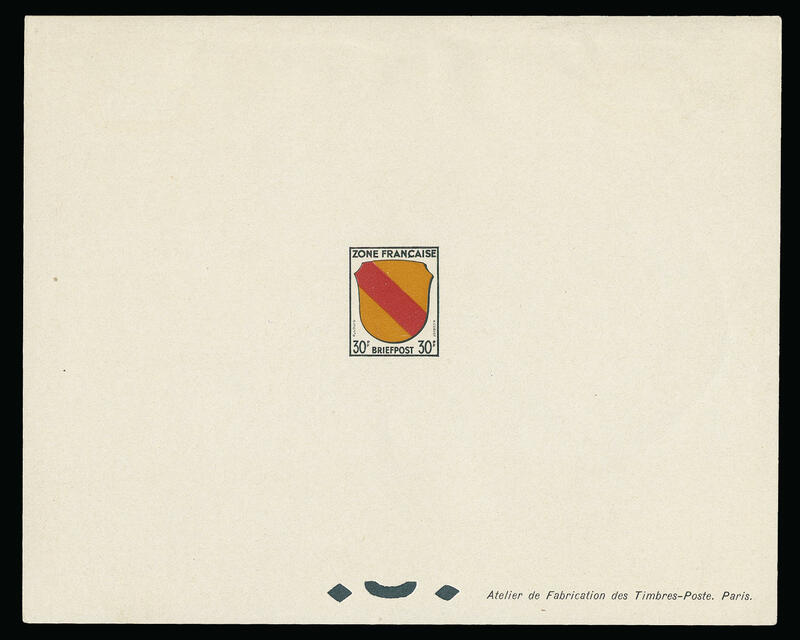 6684 1 2 Pfg. 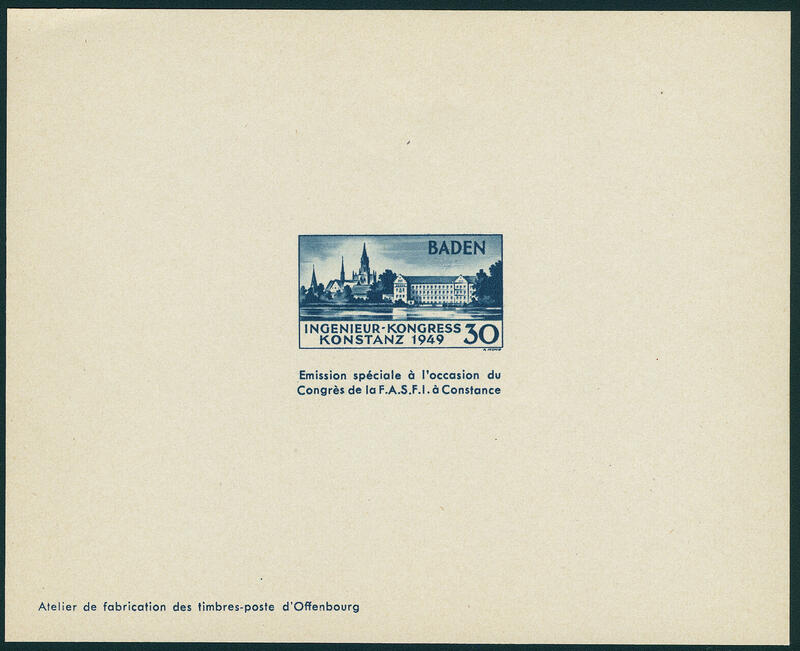 Residential construction 1949 cut with red overprint \"residential construction delivery\", fresh colors and large margins all around from right margin of sheet, in perfect condition mint never hinged a scarce and sought issue! Expertized Gagarin, Harlos BPP. 6685 2aAWb 2 Pfg. 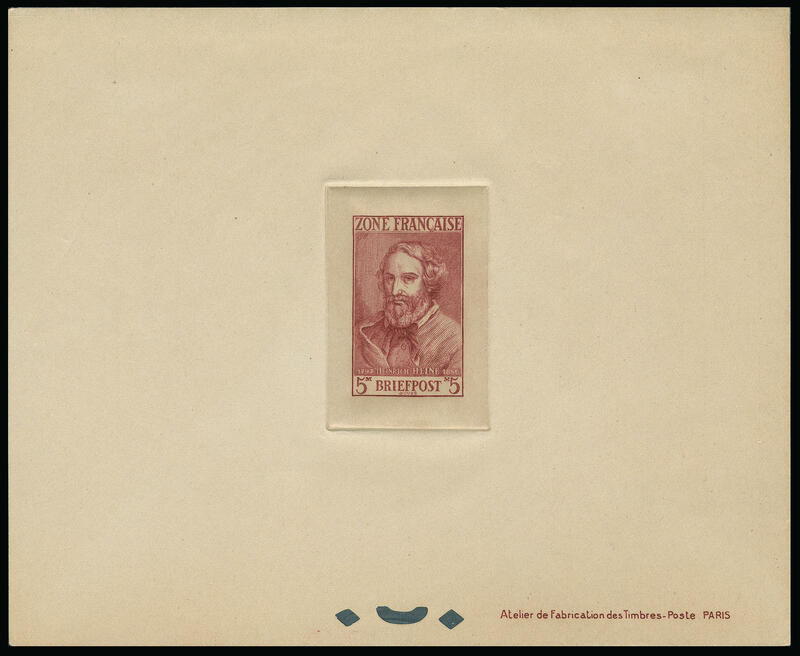 Blue, red Aulendorfer overprint, watermark 1 W, horizontal pair from the left upper corner, fresh colors and very well perforated, in perfect condition mint never hinged a wonderful unit of this rare issue for the highest standards! 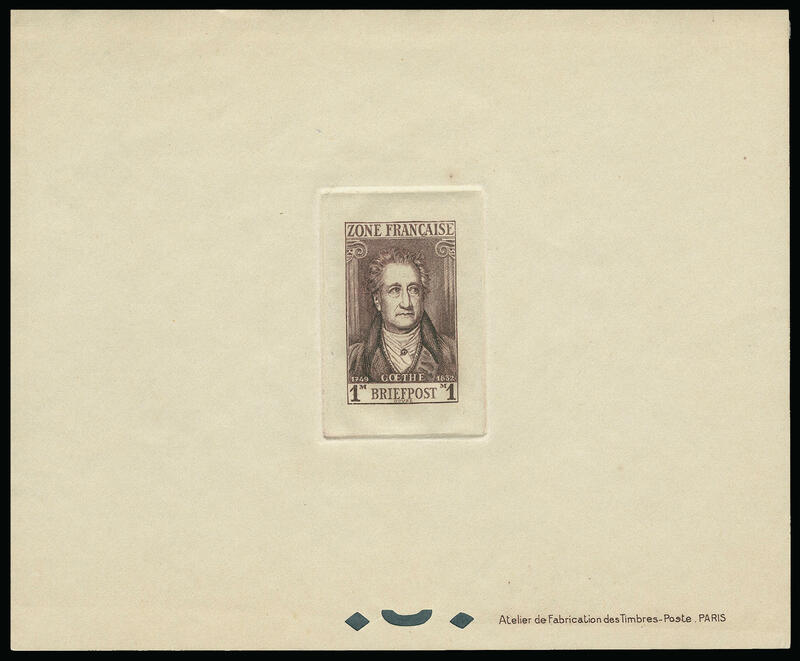 Photo expertize \"mint never hinged, genuine and immaculate\" Harlos BPP. 6686 ⊙ 2aBAW 2 Pfg. 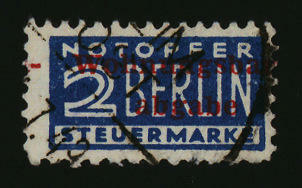 With combined perforation K14 : L12 with the rarely watermark 1 W, neat cancelled in perfect condition. Rarity of the French zone, photo expertize Harlos BPP. Michel 1300,- €. 6570 ✉ 1,9 1 Pfg. 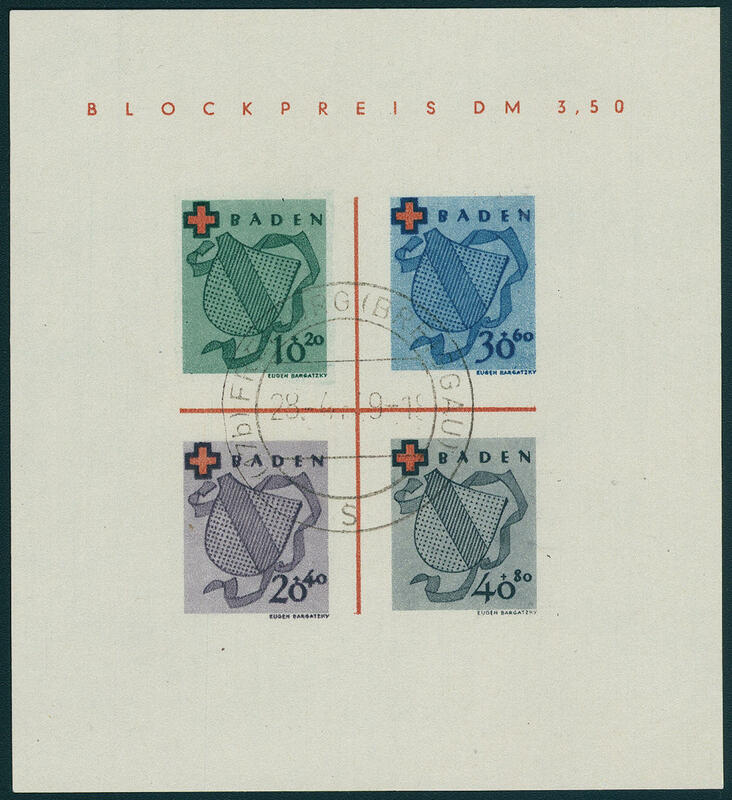 And 24 Pfg., always three times on cover from \"BADEN-BADEN 21.12.46. \", to Locarno / Menusio, commercially used. The cover is carrying censorship stamp \"GB1\" in red, on the back censorship stamp \"304\" in red, as well the chiefly still existing closing slip of paper in type 22. Very rare! 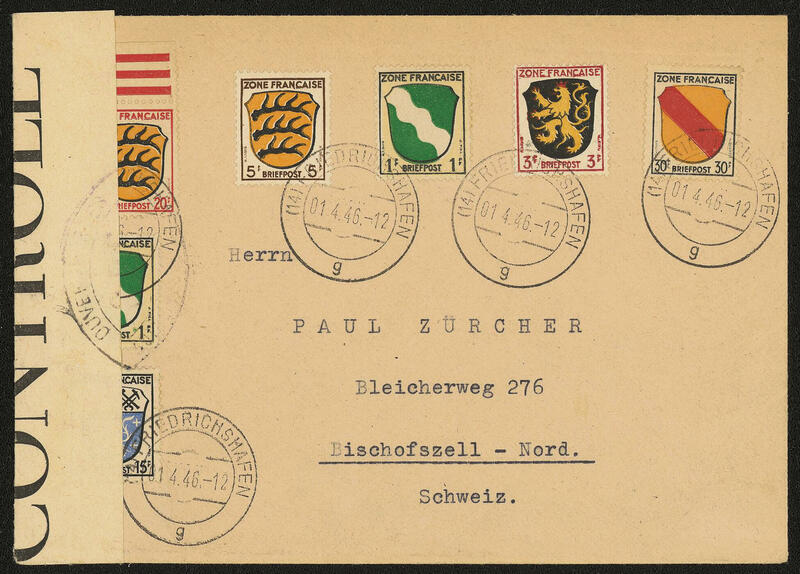 6570A ✉ 1/10ex Coat of arms, seven values on First Day Cover the readmission of the international traffic from \"FRIEDRICHSHAFEN 1.4.46. \" to Switzerland with pointed oval censorship stamp \"G. B. E. \" and closing slip of paper in type I. Rare! 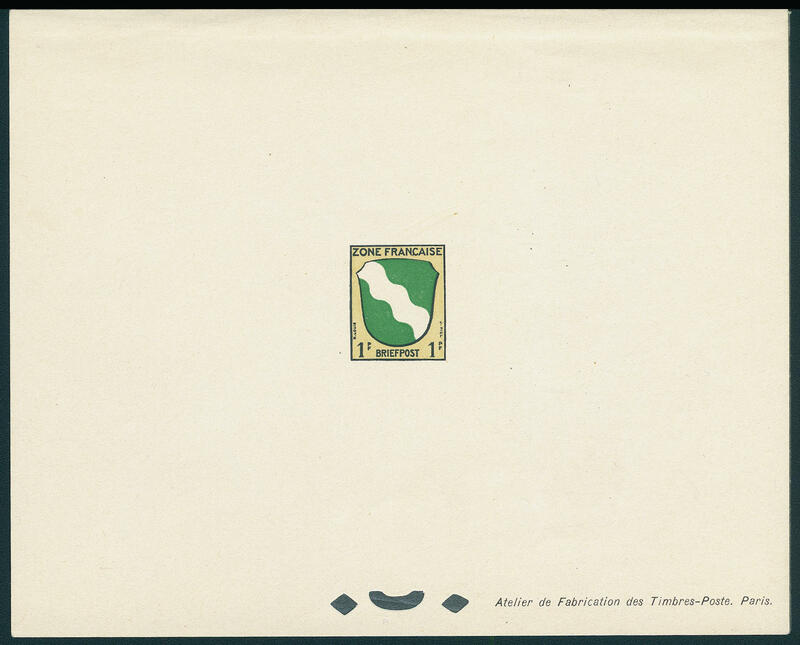 6571 1/13M Generally issue, all 13 values as Secretary of State souvenir sheets with inscription \"atelier DE FABRICATION of the Timbre postal service PARIS\". 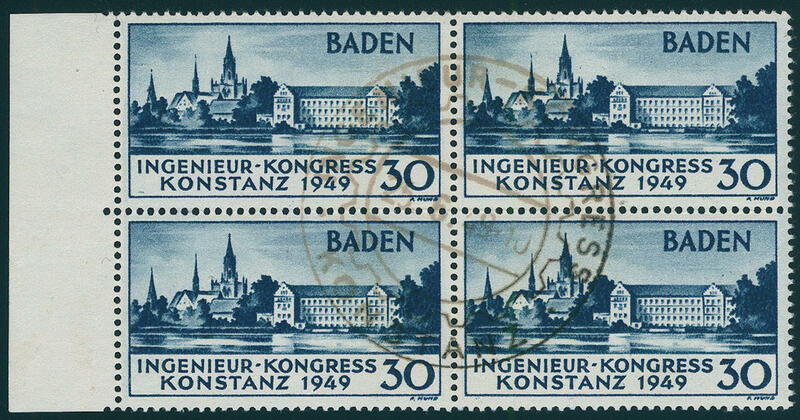 Complete minister block series of this issue to class among the rarities of this area and become almost never offered. By Michel clearly undervalued! 6572 1/13SU Generally issue, the unperforated special prints complete in horizontal pairs, wonderful fresh colors, faultless mint never hinged multiples hereof are extraordinarily rare, because these almost all cut up were. An exceptional series for the highest standards! Photo expertize \"the condition is perfect\" Hans-Dieter Schlegel BPP.